I just received notice from my favourite credit card that it will be closing as of March 15th. This meant I had to go on the hunt for a new credit card! There are so many options out there it can be very overwhelming. So here are 5 questions to ask when choosing a credit card! What type of rewards do you want? Cashback? Travel? Points? What type of reward you want will drastically change your choices when it comes to finding the right credit card for you. You have to ask yourself, is it worth it? For example one card I have used for the past two years we spent $40,000 in one year to only earn $500 in travel! Worth it? I don’t think so, I could have had cash in my pocket. $500 isn’t enough for my family to take a holiday! Is there a fee for the card? The other travel card I was talking about in the rewards category upped the fee this year to $129/year! That’s ridiculous. Many cards are offering a “free for a year” trial on cards with annual fees. Look for one of those or better yet, find one with no fee! The amount you will have to spend to earn enough points to even pay that fee are probably not worth it! How much is the Foreign transaction fee? If you plan to travel overseas often you might want to watch the foreign transaction fee. Most people don’t even realize they have one until they get a bill wondering why it is so much! Most cards charge 2.5-4% ON TOP of the exchange rate. This is called a foreign transaction fee. If you sit and home and don’t go overseas – no biggie! But if you are the person that travels for work or pleasure be sure to watch for that sneaky fee! What is the fine print? Last but certainly not least, check all the fine print. Whether the card offers a travel insurance reward or maybe the “cash back” has a limit. Do yourself a favour and read the fine print! Many people don’t even realize a credit card will let you go over limit but they will charge you anywhere from $25-40 to do so! What a rip off! Anytime you see an advertisement or credit card recommendation that person or page is probably getting paid to recommend it! So do your own research first! If the thought of researching credit cards is stressing you out don’t worry, you’re not alone. Money coaching can help you overcome fears, anxiety and stresses over money. 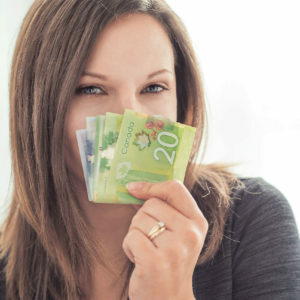 Learn more about money coaching in my FAQs!